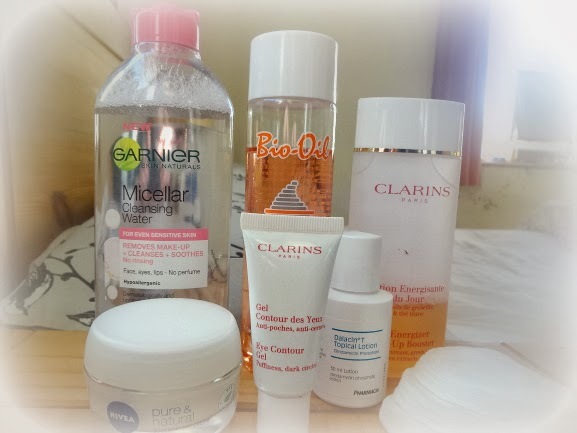 So I thought I would do an updated skincare routine because it's had a total overhaul since my previous version of this post, which to be fair was quite a while ago. I also wanted to do it because I am really happy with skin at the minute, so it must be happy with these products! (touch wood!) It's a bit of a mixture with high street, high end and even prescription but I would definitely say it's affordable considering how long the products last. My favourite thing about this skincare routine is that it's so quick and easy for a lazy skincare girl like me! First things first, I use the Garnier micellar solution on a few cotton pads (I particularly like the Boots ones!) to cleanse my face. In the morning i'll only use one to freshen up my face, night time i'll use maybe 3 or 4 depending on the amount of make up i'm wearing, including my eye make up. When I think I've got everything off, i'll go in with one more just to make doubly sure that every little bit of dirt has disappeared. This stuff is so gentle on my sensitive skin, even on my eyes which are ridiculously sensitive. Before this, I had only found one eye make up remover which wouldn't irritate my eyes. Continuing on with night time, I'll then apply a thin layer of my Dalacin T lotion which is actually a prescription item. Obviously, this isn't readily available but if you have problems with your skin I urge you to ask your doctor for this as it completely resolved my skin issues. My skin was never that bad but I was unhappy with it and I also scar easily so every spot would scar me. This sorted me right out and whilst my skin is now fine, I like to use this still to prevent it from getting worse again. Again, this is super gentle and doesn't irritate my skin or give me any dryness what so ever. If I can't be bothered to mess about and just want to be in bed, I'll then just apply my Nivea pure & natural moisturiser and that will be the end of my night time skin care routine. If I'm feeling motivated or fancy a bit of a treat I'll use Bio-oil to massage my face. I bought this after my spinal operation to use on my scar, but I never used it because I couldn't touch my scar and still can't. It just creeps me out and makes me feel all panicky and ugh, maybe one day. Facial massage is one of the most relaxing things ever, obviously more relaxing when someone else is doing it for you, but still relaxing done for yourself. I learnt this at college but i'm sure there must be tutorials on the internet. It's super relaxing and makes my skin look so bright and fresh the next day, I used this every night for a few weeks and my skin looked so much more fresh and awake. I need to get back into it! However I would not recommend applying this in the morning as it is an oil and you will look like a sweaty disco ball. 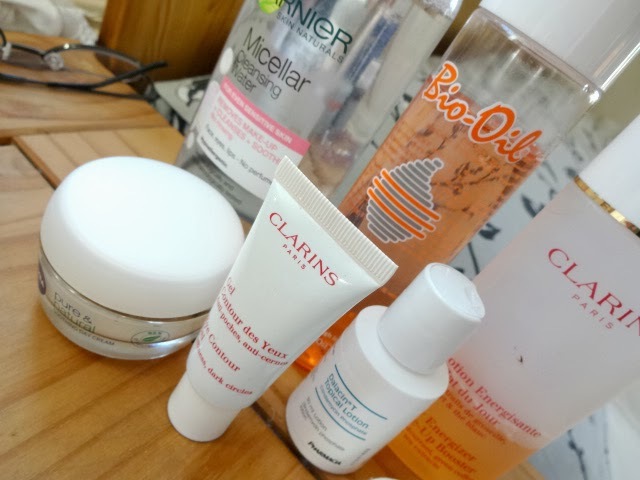 Moving back to morning skincare, after I've cleansed my face I use the Clarins Daily Energizer wake-up booster as a toner to remove any more dirt and brighten up my face, which I definitely think it does. I'm sure it actually makes me feel more awake as well! Oh and it smells amazing. I'll then apply a thin layer of my Dalacin T lotion and wait for it to sink in a bit. Then comes another Clarins product, the Clarins eye contour gel. Sometimes my eyes can get red and a little sore and dry in the mornings if I'm really tired so I bought this in aid of that. As soon as I apply this they feel so much better and almost completely back to normal. Puffiness and redness is greatly reduced and I can totally hide a hangover. ;) Also lasts forever ever. Last but not least, I'll finish off with my Nivea pure & natural moisturiser which I actually bought to use when I'd run out of my Clarins one, before I had chance to get to John Lewis for a new one. I'm SO glad I bought this because I actually prefer it and it is a loooot cheaper and lasts me a lot longer. I'll be doing a full review of this soon because I have a load of love for this one. And that is my whole day and night skincare routine. Mornings, this will take me all of 3 minutes. Evenings, 5 minutes or 10 with a quick facial massage added in. This makes me very happy, finally a skincare routine that takes me no time at all, means I don't have to even leave my bedroom for a sink, doesn't cost me too much and has made my skin very happy. Yippee! I hope you enjoyed this post and didn't get too bored with all that writing up there! Feel free to ask me any questions about any of these products in the comments, twitter or you can always drop me an email and keep an eye out for a review of the nivea moisturiser. If you're interested in the Garnier micellar solution, check out my review of the L'oreal one because I compared ingredients and they are exactly the same. The only reason I use the Garnier one is because it was bigger, cheaper and I prefer the bottle! Where did you get the Garnier micellar solution from? Sound really good! How does the Garnier micellar solution compare to Bioderma? I love bioderma so much but its so darn expensive over here in Sydney! I've purchased the Bio oil a while ago but I never thought of using it as a facial massage oil! Do you think your skin has received any benefits from the oil itself (less hyperpigmentation, more brightness etcetc)?